Compact SUVs are all the rage at the moment in the automotive industry, and part of that can be explained by the fact that more buyers want a spacious and versatile vehicle. In addition to needing space, most buyers are also looking for an enjoyable drive behind the wheel of their sport utility vehicle. For such buyers, the 2018 Volkswagen Tiguan may just be the perfect option. The 2018 Volkswagen Tiguan features a more spacious cabin compared to the previous-generation model. All 2018 Tiguan models coming to Canada are built on the SUV’s extended wheelbase, which means that you have a lot of legroom in each row. You even have the option of adding a third row of seats and transporting up to seven passengers! The 2018 VW Tiguan also gets more cargo space. There’s more than 1,000 litres available behind the rear seats, and more than 2,000 if you fold down the rear seats. That’s nearly double the space from the previous Tiguan. Under the hood, buyers will get a 2.0-litre turbocharged four-cylinder engine that delivers 184 horsepower and 221 pound-feet of torque. This engine can send its power to the front wheels in the entry-level model, or to all four wheels in the other versions through VW’s 4Motion all-wheel drive system. An eight-speed automatic transmission is standard. The 2018 Volkswagen Tiguan is now more spacious than ever, and has improved in the safety and technology departments as well. A wide range of driver assistance features are included, such as adaptive cruise control, lane departure warning, and Apple CarPlay and Android Auto. Top-of-the-line models get a 12.3-inch virtual display for the instrument cluster. 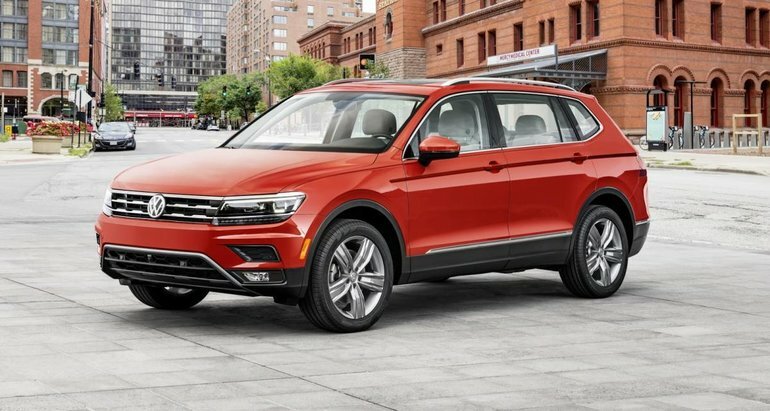 To learn more about the 2018 Volkswagen Tiguan, contact us today at Guelph Volkswagen!